(3) strength of causal relationship to the drug. Looking at the seriousness factor, kidney stones are indeed on the Important Medical Event seriousness list. 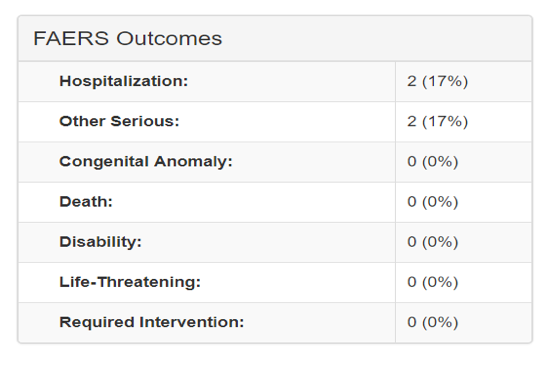 However, the outcomes for were not particularly serious despite the serious nature of kidney stones. Only 17% of the Jardiance kidney stone cases involved hospitalization, with 29% for Invokana and 41% for Farxiga. None of the cases for any of this class of drugs resulted in death or any long-term injury. An example of what this looks like on the Evidex signal validation report for Jardiance can be seen here. To establish causation, the third factor in the FDA’s guidance, the FDA provides additional factors of what should be considered: (1) the frequency of reporting, (2) whether the adverse event rate for the drug exceeds the placebo rate, (3) the extent of dose-response, (4) the extent to which the adverse event is consistent with the pharmacology of the drug, (5) the timing of the event relative to the time of drug exposure, (6) existence of challenge and dechallenge experience, and (7) whether the adverse event is known to be caused by related drugs. The second factor is an assessment of pooled clinical trial data to determine whether reporting rates are higher with the drug in question versus controls. The clinical trial details for the SGLT-2 drugs did not confirm any of the kidney stone signals. 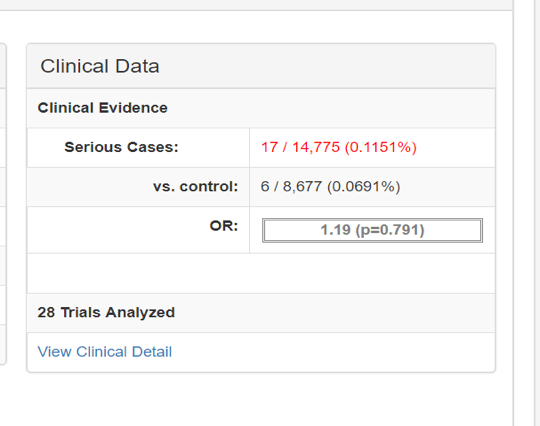 Evidex has pooled curated data from thousands of trials to provide background rates for both treatment and control groups for any adverse event signal being validated. In the case of the SGLT-2 drugs, Evidex analyzed 84 trials covering 35,000 patients to provide the expected rates of kidney stones for each of these drugs. The Evidex signal validation reports can also be useful in analyzing the other factors that the FDA suggests in determining causation. This includes a clean list of confirmed medical literature references with links to the PubMed sources for references. In the case of the SGLT-2 drugs, there were no literature references confirming causation of kidney stones. A list of all relevant case reports in the Evidex report signal allows subscribers to dig into further detail on dose response factors, time to onset of adverse event, dechallenge and rechallenge data, and a list of other drugs taken which are known causes of the safety issue. When drug safety data come together, signal validation is easier and more intuitive. Learn more.